Each year Movember sees tens of thousands of men across the planet attempt to grow moustaches for a month while raising money and awareness around important men’s health issues, including prostate cancer and mental health. Many in the hospitality world have embraced the fundraiser with fervour, so fear not when you see your local barista or bartender with a strip of fur across their upper lip for the rest of the month. Playing their part in the cause, North Fitzroy’s Empress Hotel and KAIJU! banded together to brew a mojito-inspired beer, the Movember-Jito Sour Ale. The beer will be pouring at the pub – which has temporarily changed its name to The Empress Motel – until the end of November and one dollar from each pot sold will go to the Movember Foundation. 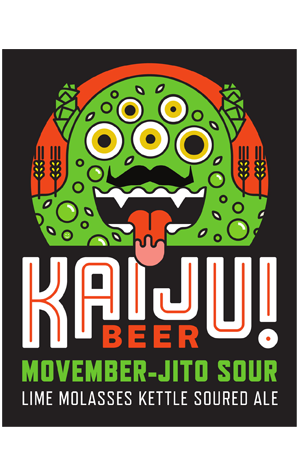 While a kettle sour might seem an unusual approach for the hop-obsessed brewers at KAIJU!, the fact the beer is loaded with limes from one of those brewer’s own trees suggests they were quick to embrace the idea. That citrus addition is apparent from the first sniff and adds a clear zest, which matches well with the sprightly carbonation. The addition of molasses also gives the beer a Caribbean cocktail-like sweetness that sits nicely up against its tartness.